Holy hybrid! In blending Oliver Twist, A Clockwork Orange, and many recognizable others into a vision of far-off America, first-timer Arellano guesses at the language of the future, but ends up sounding more like the Boy Wonder in epileptic seizure. It’s mid–century 21. A slice of pizza costs $100. Eddie is a street urchin in Dig City, an urbanscape named for the current renewal project in real-life Boston. He starts out as a contortionist “road rat,” one of a pack of boys living under the tutelage of grifter/ringmaster Shep, a Dig City small-timer. Eddie runs away from the circus to join domestic life in suburbia, going to what he has been led to believe is his true family in Ho-Ho-Kus. When he becomes distracted by his mother’s bountiful bosom, he decides “to go on a little odyssey” back to Dig City, and from there the story becomes a forced picaresque in which Eddie is asked to return home, assume command, find his parents, and come of age. Arellano’s vision sometimes achieves momentum as he builds it brick by brick, but it’s ultimately half-baked: inflation has created the Clinton (a $1,000 bill nonetheless worthless), and while Dr. Seuss is remembered, Michael Jordan has been forgotten. 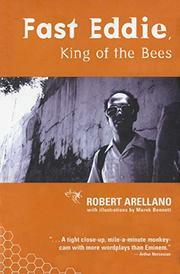 Arellano’s writing style takes center stage here, an anticipation of a world in which the polar opposites of Shakespeare and hip-hop have fused into a distressing language of forced alliteration: “With this legendary loser in mind, I pruned my performer’s pincers”; “Was this just a joke, the cruel caricature of kindness towards the scorned stowaway?” What’s meant as strategy quickly becomes fetish, and if 50-cent words were really worth 50 cents, then the inflation Arellano imagines here might just come to pass. Arellano has talent, but the many reminders that he’s read lots of books fail to save his prose. Even more distressing is the thought that his predictions might somehow prove right.